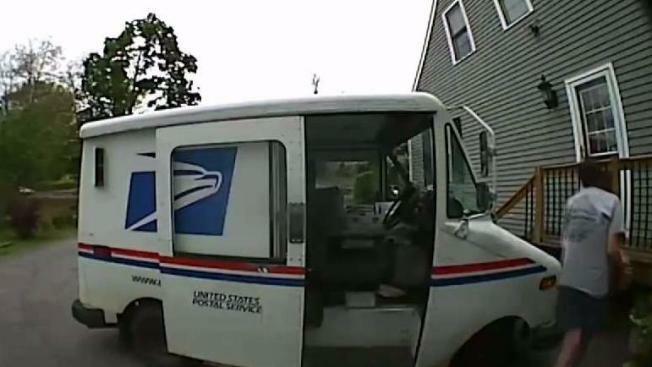 A Littleton, Massachusetts, family is outraged after they say their mailman swore repeatedly and got rough with their mail. The family said they've been complaining about their mail carrier for years, but it wasn’t until the U.S. Postal Service saw video from the family’s new security camera that they took action. Why mail carrier Peter Kerrigan was aggravated, we don’t know. But as he delivered a package to the Caffarella's Littleton home, he was seen swearing profusely. "I was just flabbergasted. I had no idea where all this anger was coming from," homeowner Darcey Caffarella said. Caffarella said they’ve been complaining about their longtime mail carrier for years. "Stuff has been missing, stuff has been delivered to other addresses," she said. She said Kerrigan will honk from the street and they often had to come to the truck to get their mail. They claim they had several packages dented, one with what looked like a footprint on it. But when they installed a home security camera after a recent break-in, they were stunned to see Kerrigan hurl their package onto the porch when he could just as easily have set it on the stairs. "The fact that a government employee was treating my property this way... I'm just disgusted," Caffarella said. Inside the package was teak oil that she had ordered from Amazon. When they opened it, they said it was leaking through the packaging. The Caffarellas said they've never had a disagreement or argument with the mail carrier that would have caused him to react in this way. While NBC Boston's Investigators were interviewing Caffarellas, the Littleton postmaster arrived at their home. He refused to comment on camera. A spokesman for the U.S. Postal Service said in an email that they have launched an investigation. “This is clearly unacceptable behavior that does not reflect the thousands of professional, dedicated carriers in our workforce," the email said. Kerrigan has been with the post office for 20 years. NBC Boston's Investigators tried to reach him at him home and by phone, but he said he had no comment. Caffarella said the postmaster wouldn’t say if Kerrigan had been reassigned to another route or if he was off the job, but did say that her video is being put to use. "They're actually using it as a training video of what not to do," she said. The postal service did not say how long the investigation might take or what will happen with Kerrigan in the meantime. The homeowners tells us a new mail carrier has delivered several packages to them since the incident and they've had no problems.